Hey! You Buckaroos, Caballeros, Cowboys, Cowgirls, Equestrians and Wranglers – Saddle Up! I have always loved horses, and living in Metro Denver just makes it better! The National Western Stock Show is a must do for me every January. When I was a kid, the highlight of my life was shaking hands with Roy Rogers and Dale Evans AND petting Trigger at a parade in Tampa! I have always been astounded because of the many Denver Metro horse properties and ranches available. 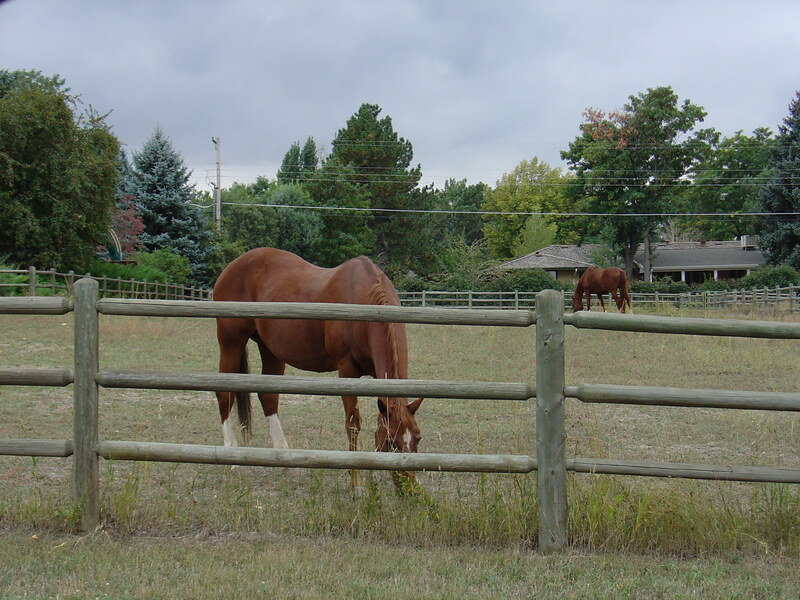 It is wonderful to see horses grazing at excutive homes in Greenwood and Cherry Hills Village, as they are so close in to the city. In fact, the I believe best definition of ‘Town and Country’ has to be those horse properties in Centennial, Englewood and ‘The Villages!’ When traveling around the area showing beautiful homes, you will see many luxury homes in Jefferson, Douglas and Elbert Counties with horses in pasture and being ridden in the late afternoons and on weekends, as it should be. Often, when working on ranch or horse property transactions over the years, I have thought of Samuel Coleridge’s poem, “The Rime of the Ancient Mariner,” written in 1798. Your well and water rights on a ranch property for horses and livestock is one of the most important aspects of the buying and selling ranch land for horses, cattle, stud farm or stables. It is critical that you know what your Colorado ranch well is certified for and whether it is an exempt or non-exempt well. If it is an exempt well, it may be a ‘Household’ or ‘Domestic/Livestock’ well and their use is different. A ‘Household’ well can only be used for inside the home and not outside. Your ranch will need at least a ‘Domestic/Livestock’ well for your horses, cattle, mules and llamas (yes, I have done one – funny animals!). Contact me for info concerning the Colorado Division of Water Resources, also known as the State Engineer’s Office for more info concerning the status of a well. For a concise page of the CO water laws, go here and you may need to hire a Water Attorney to sort out and help you determine what water rights you are entitled to. I have had some ‘funny’ experiences with water law and wells that I will post over time and they are always interesting! 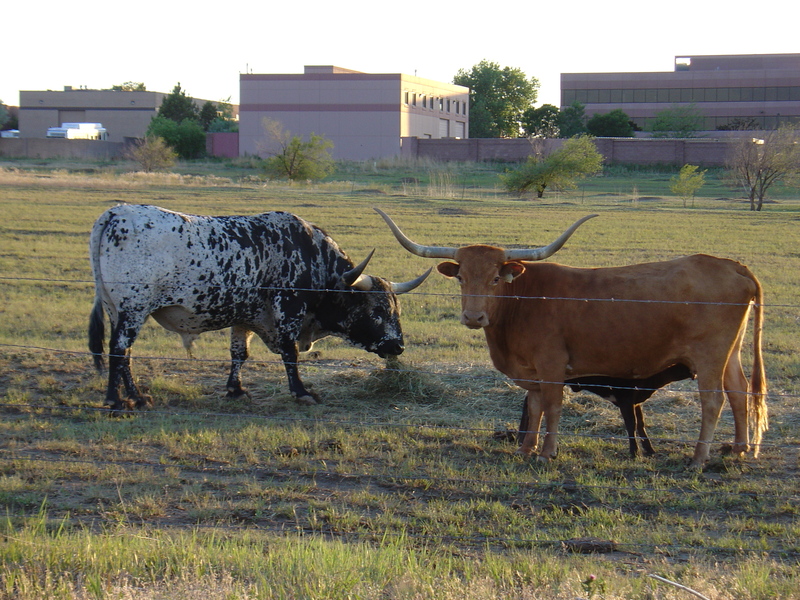 Longhorns grazing in the city of Centennial. Sometimes there are surprises while looking for Denver Metro horse properties for sale! Not entirely unrelated to Colorado ranches and horse properties, I have a great affection for Longhorn cattle. I inadvertently found this ‘western‘ scene of Longhorns not on a ranch, but in the middle of a commercial area in Centennial CO, adjacent to Greenwood Village, Lone Tree and Highlands Ranch. I always like to see them and will detour a bit when I am in the area. These had a young calf and when I approached the fence to take pictures, ‘Mama’ charged me, swung her horns and I jumped back just in time! Yeah, she scared me, but they are known to be cantankerous and not your normal welcoming committee! As the late great John Wayne said: “Courage is being scared to death but saddling up anyway.” I kept shooting but kept a careful eye out watching ‘Mama’ Longhorn.